Overall, this mic is aptly named - as a utility mic to have around in the studio it will be busy. 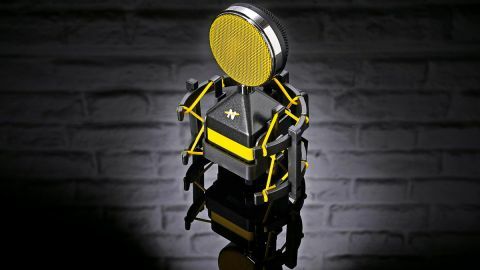 The less expensive Worker Bee bears a massive resemblance to its King Bee sibling, including having the same 'Beekeeper' suspension mount and 'Honeycomb' popshield, but its body is about half the length. Technically it's a different mic too - the capsule is smaller at 24mm, and the design could be classified as a back-electret condenser. With its cardioid polar pattern, the potential applications remain similar, however. On vocals the Worker Bee has a top-end that isn't too different to the King Bee; a little less zingy perhaps, but the bottom-end isn't quite so full, lacking some of the warmth of its sibling that could be exploited on a male vocal or voice-over. That carries over to acoustic guitar where the captured sound is a little darker. With the ability to handle SPLs up to 145dB, we found the Worker Bee did a lovely job on a loud guitar cabinet and feel it would be a useful mic to have around to play a part in micing up a drum kit.